Saturday evening Diane, Floyd and their son Steve rolled into town from El Paso, Texas. Besides dinner we enjoyed lots of stories and laughs. Around midnight it was time to call it quits. We agreed to meet at Trolley Junction for breakfast. So here we are...and having more fun than a barrel of monkeys. From left...Mel, me, Sue, Diane, Floyd, Steve, Bradley, and Cheryl. Eventually, Mel told the waitress to stop by our table with some menu's and ask us if we were ready for lunch. Sort of a hint to relinquish our tables. ...So we moved outside into the sunlight for our goodbyes. Last weekend we saw Clint Eastwood's latest movie "Gran Torino." The movie is symbolic. Old style heroic men verses bully type hoodlum gangs in our deteriorating society. Rough, tough, make my day Clint at his best. This weekend it was Texas Floyd's real life escapades. He's a little bit of Clint and Indiana Jones characters (hahaha) rolled into one, and heroine Diane has valiantly survived them all. Their story would make a great book, or a movie. With this in mind I gave Floyd a journal for that purpose. One of the funniest escapades he told us about happened one day when he was flying his plane back to El Paso. He glanced at his wristwatch, and was dismayed that he was going to miss his favorite television program... "Star Trek." Not far below he spotted a road leading up to a large house on a hill. He landed the plane near the house. The concerned owner asked him if everything was okay. Floyd replied that it was, and then asked the man if he had a television. He said he did, and Floyd asked if he could watch his favorite program, which they did together. The bold, somewhat bizarre introduction developed into friendship. Anyway, between Floyd and Steve's stories, and Cheryl's experiences while she was a Marine....most of our visit was spent laughing. Proof that laughter is great medicine for whatever. 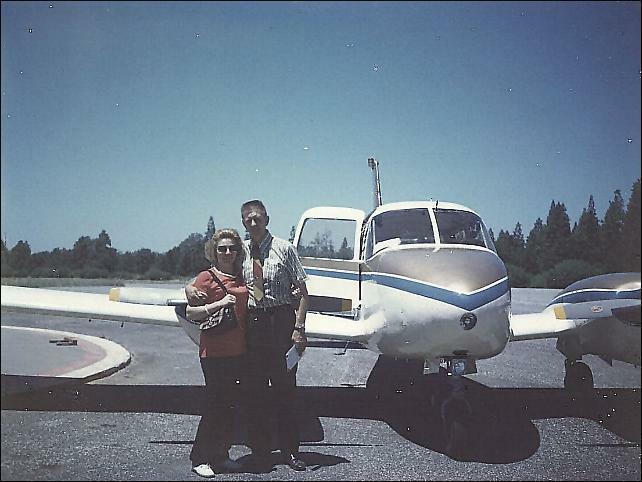 Diane and Floyd when they flew here July 7, 1971. We were all considerably younger then. 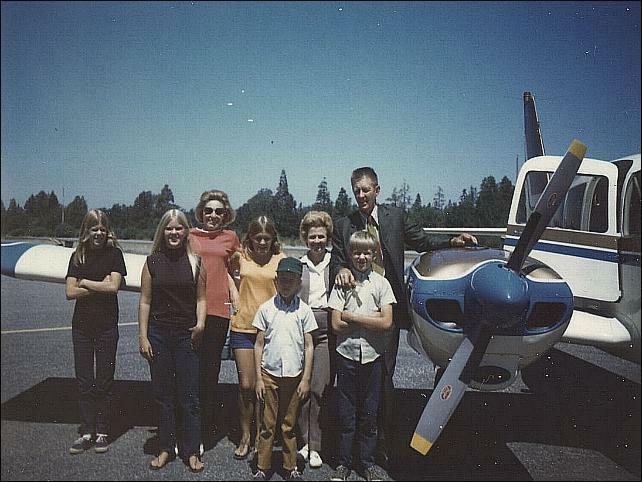 From left...Sue, Margie, Diane, Cheryl, me, Floyd, Kirk and Mike at the Loma Rica Air Park. Wish Floyd, Diane and Steve could have stayed longer this time, but whatever time we spend together is always a wonderful experience.